Tech companies are resorting to increasingly peculiar measures to look like they’re taking action against so-called Islamic State. The latest: Google will show anti-terrorism links to people who search for extremist content. This is a bizarre policy, for a number of reasons. 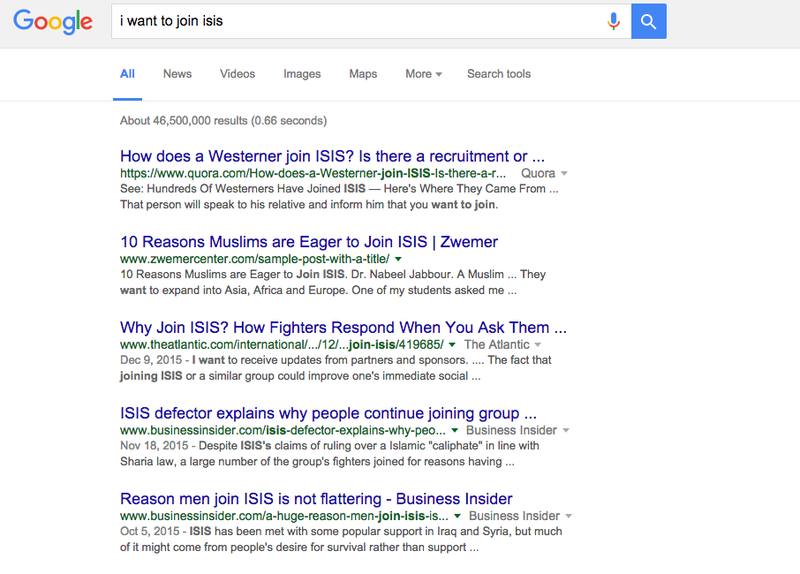 First of all, it’s not clear which search terms will prompt the counter-programming beyond “join ISIS”. Would typing something more ambiguous like “hot ISIS teens” or “Daesh good?” cause the same response? Is this only for people who want to join the Islamic State, or does Google do the same for wannabes of less trendy terrorist organisations? I also asked Google if it has any mechanisms to distinguish people doing research (LIKE ME!!! I’M NOT A TERRORIST!) and people planning a crime — because I tested this concept using House’s example. The “join ISIS” example Google gave centered on the Islamic State, but what if the company expands this pilot program? What other groups would qualify? Google’s decision to allow organisations to alter ads* on search results to prevent people from aligning themselves with a group — no matter how odious the group is — is blatantly political. It’s a precedent-setting manoeuvre that permits the company to tailor its results based on perceptions of users’ ideologies. It’s a leap that underlines Google’s willingness to guess its users’ intentions when they search for something — and shows that Google is willing to guess its users’ intentions to commit crimes when they search for something. *This statement originally implied that Google altered its search results directly. I changed the wording to clarify that Google allowed partner organisations to alter the ads on search results.